The proposed work for this project was to remeander and stabilize a failing reach of Paradise Creek and to increase its flood storage capacity of this reach. This stabilization was achieved through the reconfiguration of approximately 860 linear feet of a straight, ditch-like creek to a lowflow channel with a new floodplain. The newly constructed lowflow channel has a 3 foot bottom width and a depth of 1.5 feet. The newly constructed channel was stabilized with a number is different bank stabilization treatments. Bank revetments were placed in scour susceptible zones along outer bend banks. Extensive revetments were required because of the flashiness of this stream and because of downstream sediment concerns. Bank revetments also restrict the lateral movement of the channel. This is important due to its presence in the urban environment. The crown of the stream channel was rounded off to make a smooth transition to the floodplain surface. All outside bank slopes were then seeded with a native riparian grass mix and lined with 100% biodegradable geotextile fabric. The fabric was carried over the top of the slope crown onto the level edge of the floodplain surface. Open weave straw matting was used in lower energy areas; tighter weave coir matting will be used in higher energy areas. The coir fabric will retain its structural integrity for at least 5 years, the straw matting for 2-3 years. This will allow time of the establishment of a dense herbaceous ground cover on all bank surfaces. Two newly constructed wetland areas were also created in this project. These wetland areas are approximately 1-1.5 feet in depth and have a 5:1 slope on each side. 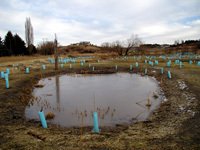 An existing wetland at the site was extended to enhance its habitat. A portion of the excavated soil was used to fill in the existing channel. The remainder of the excavated soil was moved off site. The City of Moscow received the excess soil present after the construction of the site. Native woody vegetation was planted in the project and will continue to be planed over the period of years. Species were selected from a comprehensive list of riparian and upland trees and shrubs endemic to this environment. This reach of Paradise Creek had near vertical, slumping, eroding streambanks that were straightened due to dredging activities. The banks were generally steep averaging between 1H: 1V and 2H: 1V. This steepness in the banks was contributing to the sediment load in the creek by under cutting and eroding the banks. The majority of the streambank soil was exposed but for a few patches of reed canary grass which had become the dominant species present as well as other noxious weeds. There is very little diversity in vegetation at this site. There was no native woody vegetation present to act in shading for the creek. Which is needed for the reduction of stream temperature, for which Paradise Creek is listed in its TMDL as a pollutant. Finished Project: This Fall 2002 picture shows the restoration site after it was constructed and planted. Work has continued into the Spring and Summer of 2003, including the completion of an outdoor classroom/observation deck for use in some of our environmental education classes.The project was featured in the March/April 2003 issue of Land and Water Magazine. 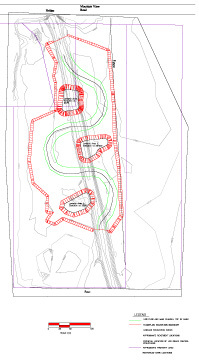 The reinstatement of a “natural” channel plan geometry of three meander bends through the existing channel alignment, (green meanders). The creation of a functional floodplain (larger red area), and the reestablishment of native riparian vegetation along the channel banks and in the floodplain to create a riparian corridor. Benefits of this project will be realized in 1) the improved habitat of the area for aquatic and terrestrial species, 2) improved water quality 3) increased passive recreation and educational opportunities and 4) enhanced aesthetic values. By restoring the floodplain and active channel, this work provides some improvement with respect to local flood storage and downstream flow attenuation. Remeandering the channel improves aquatic habitat conditions by introducing non-uniform channel geometry to this channelized reach of Paradise Creek. Revetments along the banks of the channel bends increase the stability of the banks while providing increased wildlife opportunities. Several different types of labor intensive bank stabilization methods were used, including “soft? bioengineering treatments. Revegetation of the entire site with native trees, shrubs, wetland plants, and grasses will ultimately play an important role in realizing all of the enumerated benefits listed. Previous Conditions: This reach of Paradise Creek was near vertical, slumping, eroding streambanks that had been straightened due to dredging activities. The banks were generally steep averaging between 1H: 1V and 2H: 1V. This steepness in the banks was contributing to the sediment load in the creek by under cutting and eroding the banks. The majority of the streambank soil was exposed but for a few patches of reed canary grass which has become the dominant species present as well as other noxious weeds. There was very little diversity in vegetation at this site. There was no native woody vegetation present to act in shading for the creek, needed for the reduction of stream temperature, for which Paradise Creek is listed in its TMDL as a pollutant. Description of Project: The proposed work for this project is to remeander and stabilize a failing reach of Paradise Creek and to increase the flood storage capacity of this reach. This stabilization will be achieved through the reconfigure of approximately 850 linear feet of a straight, ditch-like creek to a lowflow channel with a new floodplain. 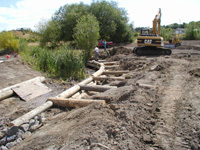 The newly constructed lowflow channel will have a 3 foot bottom width and a depth of 1.5 feet. Bank Revetments: The newly constructed channel will be stabilized with a number is different bank stabilization treatments. Bank revetments will be placed in scour susceptible zones along outer bend banks. 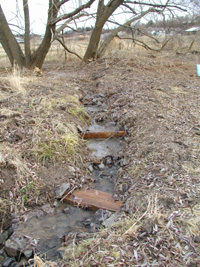 Extensive revetments are required because of the flashiness of this stream and because of downstream sediment concerns. Bank revetments will also restrict the movement of the channel. This is important due to the urban environment. 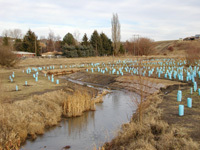 Woody streambank vegetation will be planted along all revetments. Native riparian hardwoods such as shrub willows, aspen and dogwood will eventually provide intertwining root networks for long term bank stabilization in these areas. 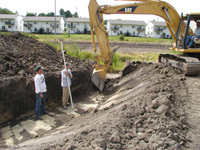 Bank revetment types include: Log crib revetment, Rock and root wad revetment, Soil wraps, Stacked coir log revetments. 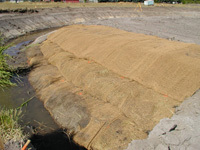 Geotextile Fabric and Erosion Control: The crown of the stream channel will be rounded off to make a smooth transition to the floodplain surface. All bank slopes will be then seeded with a native riparian grass mix and lined with 100% biodegradable geotextile fabric. The fabric will be carried over the top of the slope crown onto the level edge of the floodplain surface. Open weave straw matting will be used in lower energy areas; tighter weave coir matting will be used in higher energy areas. The coir fabric will retain its structural intergrity for at least 5 years, the straw matting for 2-3 years. This will allow time of the establishment of a dense herbaceous ground cover on all bank surfaces. Wetland Creation: Three newly constructed wetland areas were created in this project. These wetland areas are approximately depth of 1-1.5 feet and have a 5:1 slope on each side. An existing wetland at the site was extended to enhance its habitat. Detail: PCEI staff and volunteers designed the project with a high degree of detail. Shown here is a log and rock drop structure to help stabilize the soil and prevent erosion in one are that drains a previously existing wetland. Revegetation: Native woody vegetation were planted in the project are over the period of years. Species were selected from a comprehensive list of riparian and upland trees and shrubs endemic to this environment. From the Air (11/15/03): Paradise Creek Meanders through its newly restored channel between single family homes to the left and apartment buildings to the right.